A rumor out of East Asia on Tuesday suggests Apple might ditch aluminum for forged stainless steel in crafting its next-generation iPhone, lending credence to predictions of an "iPhone 8" with "glass sandwich" design. Citing Taiwanese sources, hit-or-miss publication DigiTimes reports Apple has bypassed usual supplier Foxconn and placed orders for forged stainless steel iPhone casings from manufacturing partner Jabil. Apple's last iPhone to rely on stainless steel was the iPhone 4s, which wrapped two CNC-machined bands made from a bespoke steel alloy around a "glass-sandwich" body. Since the iPhone 5 series, however, Apple has favored aluminum as the metal of choice for iPhone. The lightweight yet durable alloy is a Cupertino favorite used to manufacture everything from iPhone 7 and 7s to Apple Watch to Mac. After the iPhone 6 "bend-gate" fiasco in 2014, which claimed the handset could be easily deformed, Apple switched to 7000-series aluminum first applied in the original Apple Watch. While Apple is rumored to return to steel with the "iPhone 8" chassis, the fabrication process will be notably different from that of iPhone 4 and 4s. In particular, the company is said to be using a metal forging method instead of common billet milling. Forging is a machining method that essentially squeezes a metal alloy between two halves of a mold —tool and die —to form a finished part. Compared to components crafted using subtractive machining methods like CNC, forged blanks provide superlative structural rigidity and can in some cases afford greater latitude in the design process. Considering Apple's penchant for finely finished products, and the need for details like internal screw threads and anchor points, it is likely that CNC tooling will play at least a small role in construction. Mac Otakara noted the potential move to stainless steel earlier today. Today's rumor is consistent with reports suggesting a next-generation handset will adopt a substantially glass design when it debuts later this year. 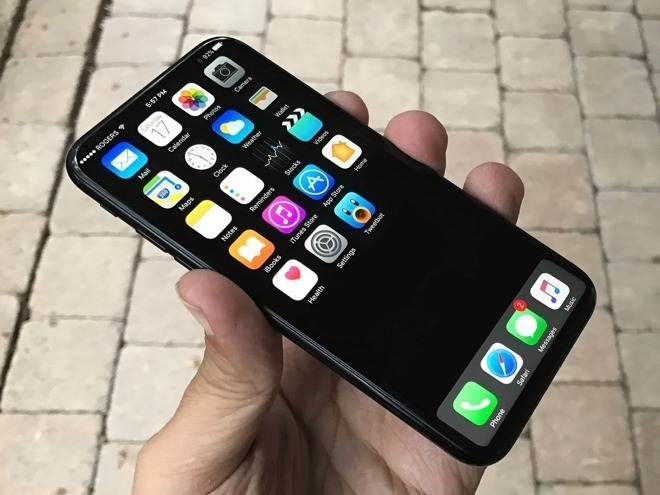 Noted analyst Ming-Chi Kuo first revealed Apple's plans for a glass-backed iPhone last April, since expanding the prediction to include exotic technologies like an OLED display, wireless charging, an invisible home button and more. As always, Apple is expected to thin down iPhone's general profile in 2017, making the need for strong, lightweight materials a necessity. If the product also borrows design cues from iPhone 7, specifically curved edges, it could explain the decision to forge rather than mill.